UP Chowkidar Salary 2018:- Latest Update 10 May 2018 UP Govt may increase salary of Chowkidar and also said to give cycles to chowkidar who are working village. The up village chowkidar selection process done through physical date and medical exam, call letter to appear for the PST (Physical date Standard Test)/Scrutiny of document check is purely provisional admit card. If later at any stage it is found that you did not fulfill any of the chowkidar result 2016 eligibility conditions, your candidature is liable to be cancelled and no appeal against such cancellation will be entertained. Hence you are advised to kindly ensure properly that you fulfill all the eligibility conditions given in the chowkidar recruitment 2015 advertisement. Educational Qualification for UP Gram Panchayat Chowkidar bharti 2018 : Candidates should pass class 8 the examination or equivalent. UP Gram Panchayat Chowkidar Candidates age limit should be 18 to 40 years. Upper age SC ST and OBC relaxation for the reserve category candidates as per Govt. rules. 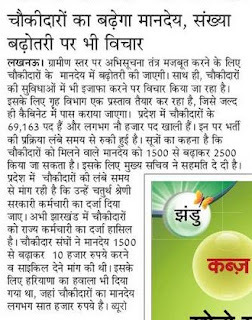 Salaries of UP chowkidar post will be 3000 TO 10,000 rupees per month. Previously chowkidar monthly salary payment was 1500 rs per month will be retired on 60th year. How to Apply for Eligible and interested candidates can apply online through UP Gram Panchayat adhikari bharti 2018 online portal at www.bor.up.nic.in.